1.4.1 1984–1987: The "Twin Towers"
The Rockets were founded in 1967 in San Diego by Robert Breitbard, who paid an entry fee of US $1.75 million to join the NBA as an expansion team for the 1967–68 season. The NBA wanted to add more teams in the Western United States, and chose San Diego based on the city's strong economic and population growth, along with the local success of an ice hockey team owned by Breitbard, the San Diego Gulls. The resulting contest to name the franchise chose the name "Rockets", which paid homage to San Diego's theme of "a city in motion" and the local arm of General Dynamics developing the Atlas missile and booster rocket program. Breitbard brought in Jack McMahon, then coach of the Cincinnati Royals, to serve as the Rockets' coach and general manager. The team, that would join the league along with the Seattle SuperSonics, then built its roster with both veteran players at an expansion draft, and college players from the 1967 NBA draft, where San Diego's first ever draft pick was Pat Riley. The Rockets lost 67 games in their inaugural season, which was an NBA record for losses in a season at the time. In 1968, after the Rockets won a coin toss against the Baltimore Bullets to determine who would have the first overall pick in the 1968 NBA draft, they selected Elvin Hayes from the University of Houston. Hayes improved the Rockets' record to 37 wins and 45 losses, enough for the franchise's first ever playoff appearance in 1969, but the Rockets lost in the semi-finals of the Western Division to the Atlanta Hawks, four games to two. Despite the additions of Calvin Murphy and Rudy Tomjanovich and the management of Hall of Fame coach Alex Hannum, the Rockets tallied a 67–97 record in the following two seasons and did not make the playoffs in either season. Because of the low performance and attendance, Breitbard looked to sell the team, and in 1971, Texas Sports Investments bought the franchise for $5.6 million, and moved the team to Houston. The franchise became the first NBA team in Texas, and the nickname "Rockets" took on even greater relevance after the move, given Houston's long connection to the space industry. Before the start of the 1971–72 season, Hannum left for the Denver Rockets of the American Basketball Association – later renamed Denver Nuggets, who joined the NBA in 1976 – and Tex Winter was hired in his place. However, Winter's clashes with Hayes, due to a system that contrasted with the offensive style to which Hayes was accustomed, made Hayes ask for a trade, leaving for the Baltimore Bullets at the end of the 1971–72 season. It was also around this time that the Rockets would unveil their classic yellow and red logo and accompanying uniforms used until the end of the 1994–95 season. Winter left soon after, being fired in January 1973 following a ten-game losing streak, and was replaced by Johnny Egan. Egan led the Rockets back to the playoffs in 1975, where the franchise also won their first round against the New York Knicks, subsequently losing to the veteran Boston Celtics in 5 games. At that time the Rockets gained popularity in Houston, selling out several home games during the regular season as the Rockets battled for a playoff spot and then selling out all of their home playoff games. In the 1975–76 NBA season the Rockets finally had a permanent home in Houston as they moved into The Summit, which they would call home for the next 29 years. During the period, the franchise was owned by Kenneth Schnitzer, developer of the Greenway Plaza which included The Summit. After missing the 1976 playoffs, Tom Nissalke was hired as a coach, and pressed the team to add a play-making guard in college standout John Lucas and a rebounding center through Moses Malone, who he had coached in the ABA. The additions had an immediate impact, with the 1976–77 Rockets winning the Central Division and going all the way to the Eastern Conference Finals, losing to the Julius Erving's Philadelphia 76ers 4 games to 2. The following season had the team regressing to just 28 wins due to an injury to captain Tomjanovich, who got numerous facial fractures after being punched by Kermit Washington of the Los Angeles Lakers and wound up spending five months in rehabilitation. After trading Lucas to the Golden State Warriors in exchange for Rick Barry, the Rockets returned to the playoffs in 1978–79, with "The Chairman Of The Boards" Moses Malone receiving the 1979 MVP Award, but the team was swept 2–0 by Atlanta in the first round. Nissalke was let go, and assistant Del Harris was promoted to head coach. In 1979, George Maloof, a businessperson from Albuquerque, New Mexico, bought the Rockets for $9 million. He died the following year, and while the Maloof family expressed interest in selling the team, George's 24-year-old son Gavin took over the Rockets. A buyer was eventually found in 1982 as businessman Charlie Thomas and Sidney Shlenker purchased the franchise for $11 million. The Maloof period of ownership marked the first dominant period of the Rockets, highlighted by the team's first NBA Finals appearance in 1981. Prior to the 1980–81 season, the arrival of the Dallas Mavericks led to an NBA realignment that sent the Rockets back to the Western Conference. Houston qualified for the playoffs only in the final game of the season with a 40–42 record. The postseason had the Rockets beat the Lakers, in-state rivals San Antonio Spurs, and the equally underdog Kansas City Kings to become only the second team in NBA history (after the 1959 Minneapolis Lakers) to have advanced to the Finals after achieving a losing record in the regular season. In the final round facing Larry Bird's Boston Celtics in the finals round, the Rockets blew a late lead in Game 1 and won Game 2 at the Boston Garden. However, afterwards the team failed to capitalize on the early success against the favored Celtics, and eventually lost in six games. While new owner Charlie Thomas expressed interest in renewing with Moses Malone, who had been again chosen as MVP in 1981–82, the Rockets traded him to the Philadelphia 76ers for Caldwell Jones, as a declining regional economy made the Rockets unable to pay Malone's salary. When the Rockets finished a league worst 14–68, Celtics coach Bill Fitch was hired to replace outgoing Del Harris, and the team won the first pick of the 1983 NBA draft, used to select Ralph Sampson from the University of Virginia. Sampson had good numbers and was awarded the NBA Rookie of the Year award, but the Rockets still finished last overall, again getting the top pick at the upcoming 1984 NBA draft, used to select Hakeem Olajuwon from the University of Houston. In his first season, Olajuwon finished second to Michael Jordan in NBA Rookie of the Year balloting, and the Rockets record improved by 19 games, good enough for a return to the playoffs as the third best team in the West, where they were upset by the sixth-seeded Utah Jazz. The Olajuwon and Sampson duo earned much praise, and was nicknamed "Twin Towers". In the following season, Houston won the Midwest Division title with a 51–31 record. The subsequent playoffs had the Rockets sweeping the Sacramento Kings, having a hard-fought six-game series with Alex English's Denver Nuggets, and then facing defending champion Lakers, losing the first game but eventually managing to win the series – the only Western Playoffs defeat of the Showtime Lakers – to get to the franchise's second Finals appearance. The NBA Finals once again matched the Rockets up against the Celtics, a contrast to Houston's young front challenging the playoff-hardened Celtics front court of Larry Bird, Kevin McHale and Robert Parish. The Celtics won the first two games in Boston, gave the Rockets their only home playoff defeat that season in game 4, and clinched the title as Bird scored a triple-double on Game 6. After the Finals, Boston coach K.C. Jones called the Rockets "the new monsters on the block" feeling they had a bright future. But the team had a poor start to the following season amidst players getting injured or suspended for cocaine usage, and during the playoffs were defeated in the second round by Seattle SuperSonics in six games, with the final game being a double-overtime classic that saw Olajuwon notching 49 points, 25 rebounds and 6 blocks in defeat. Early in the 1987–88 season, Sampson, who had signed a new contract, was traded to the Golden State Warriors, bringing the Twin Towers era to an end just 18 months after their Finals appearance. Sampson's once-promising career was shortened due to chronic knee injuries, which forced his retirement in 1991. Jones' prophecy of a Rockets dynasty never materialized until the early 1990s. In the next five seasons, the Rockets either failed to qualify for the playoffs or were eliminated in the first round. The first elimination in 1988 led to Fitch's dismissal, with Don Chaney replacing him as head coach. Chaney, like Olajuwon, also played for the Houston Cougars under Guy Lewis, having played along Elvin Hayes in the late 1960s. Chaney had his best season during 1990–91, where he was named the Coach of the Year after leading the Rockets to a 52-30 record despite Olajuwon's absence due to injury for 25 games. Despite Olajuwon's usual strong numbers, the underwhelming roster could not be lifted out of mediocrity. However, the attempts to rebuild the team nucleus incorporated players that would later make an impact in the years to come, such as Kenny Smith, Vernon Maxwell, Robert Horry, Mario Elie, Sam Cassell and Otis Thorpe. Midway through the 1991–92 season, with the Rockets' record only 26–26, Chaney was fired and replaced by his assistant Rudy Tomjanovich, a former Houston player himself. While the Rockets did not make the playoffs, Tomjanovich's arrival was considered a step forward. In the next year, the Rockets improved their record by 13 games, getting the Midwest Division title, and winning their first playoff series in 6 years by defeating the Los Angeles Clippers, before an elimination by the SuperSonics in a closely contested Game 7 overtime loss. On July 30, 1993, Leslie Alexander purchased the Rockets for $85 million. Following the bitter Game 7 loss in Seattle in overtime, Olajuwon gathered the team and famously stated "we go from here". The next season, in Tomjanovich's second full year as head coach, the Rockets began the 1993–94 season by tying an NBA record with a start of 15–0. Led by Olajuwon, who was named the MVP and Defensive Player of the Year, the Rockets won 58 games, a franchise record at the time. After quickly dispatching the Portland Trail Blazers (who had made the finals just two years prior) in 4 games, they then faced the defending Western Conference champion Phoenix Suns, led by the previous year's MVP Charles Barkley. The series opened up in Houston, which saw the Rockets open up a big lead going into the fourth quarter. In both games, however, the Rockets inexplicably collapsed to allow the Suns a 2-0 lead going back to Phoenix. Following recent heart-breaking playoff losses by the Houston Oilers, it appeared as though the Rockets were doomed. Local newspapers labeled Houston as "Choke City", which the Rockets took to heart and ultimately came back to win the series in seven games. As "Choke City" became "Clutch City", the name permanently became a part of Houston folklore. The Rockets then soon defeated John Stockton and Karl Malone's Utah Jazz in five in the Conference Finals to advance to their third finals. The New York Knicks opened a 3-2 advantage, but the Rockets won the last two games on their home court and claimed their first championship in franchise history. Olajuwon was awarded the Finals MVP, after averaging 27 points, nine rebounds and four blocked shots a game. The Rockets initially struggled in the first half of the 1994–95 season, which they fixed by sending Otis Thorpe to the Portland Trail Blazers in exchange for Olajuwon's former college teammate Clyde Drexler. With only 47 wins, the Rockets entered the playoffs as the sixth seed in the Western Conference. Still, a strong playoff run that earned Houston the nickname "Clutch City" had the Rockets defeating the West's top three seeds – the Jazz, Suns and Spurs – to reach back-to-back finals, this time against the Orlando Magic, led by Shaquille O'Neal and Anfernee "Penny" Hardaway. When Houston swept the series in four straight games, they became the first team in NBA history to win the championship as a sixth seed, and the first to beat four 50-win teams in a single postseason en route to the championship. Olajuwon was again the Finals MVP, only the second player after Michael Jordan to win the award two years in a row. It was on the floor of The Summit after they captured their second title that head coach Rudy Tomjanovich proclaimed, "Don't ever underestimate the heart of a champion!" During the off-season, the Rockets went for a change of visual identity, making navy blue and silver the new primary colors while adopting a new cartoon-inspired logo and pinstriped jerseys. The Rockets won 48 games in the 1995–96 season, in which Olajuwon became the NBA's all-time leader in blocked shots. The playoffs had the Rockets beating the Lakers before a sweep by the SuperSonics. Before the start of the succeeding season, the Rockets sent four players to Phoenix in exchange for Charles Barkley. The resulting "Big Three" of Olajuwon, Drexler, and Barkley had a strong debut season with a 57–25 record, going all the way to the Western Conference finals before losing to the Utah Jazz 4–2 on a dramatic last-second shot by John Stockton. The following season was marked by injuries, and Houston finished 41–41 and the 8th seed, leading to another elimination by the top-seeded Jazz. Drexler retired after the season, and the Rockets traded to bring in Scottie Pippen to take his place. In the lockout-shortened 1998–99 season, the Rockets lost to the Lakers in the first round of the playoffs. After the 1999 draft, the Rockets traded for the second overall pick Steve Francis from the Vancouver Grizzlies, in exchange for four players and a first-round draft pick. However, after Houston traded a discontented Pippen to Portland, and Barkley suffered a career-ending injury, the rebuilt Rockets went 34–48 and missed the playoffs, for only the second time in 15 years. In the 2000–01 season, the Rockets worked their way to a 45–37 record. However, in a competitive Western Conference where seven teams won 50 games, this left the Rockets two games out of the playoffs. In the following off-season, a 38-year-old Olajuwon requested a trade, and, despite stating their desire to keep him, the Rockets reached a sign-and-trade agreement, sending him to the Toronto Raptors. The ensuing 2001–02 season—the first without Hakeem in two decades—was unremarkable, and the Rockets finished with only 28 wins. 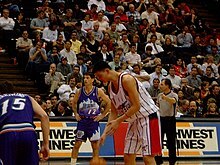 After Houston was awarded the first overall pick in the 2002 NBA draft, they selected Yao Ming, a 7 feet 6 inches (2.29 m) Chinese center. The Rockets missed the 2003 playoffs by one game, improving their record by 15 victories. The 2003–04 season marked the Rockets' arrival to a new arena, the Toyota Center, a redesign of their uniforms and logo, and their first season without Rudy Tomjanovich, who resigned as head coach after being diagnosed with bladder cancer. Led by former Knicks coach Jeff Van Gundy, the Rockets finished the regular season with a record of 45–37, earning their first playoff berth since 1999, again losing to the Lakers in the first round. In the off-season, Houston saw major changes in the roster as the Rockets acquired Tracy McGrady in a seven-player deal with the Orlando Magic. The scoring champion McGrady and the strong rebounder Yao formed a well-regarded pair that helped the Rockets win 22 consecutive games in the 2007–08 season, which was at the time the 3rd longest winning streak in NBA history. Still, the duo was plagued with injuries – of the 463 regular season games for which they were teammates, Yao missed 146 and McGrady 160 – and did not win any playoff series, despite gathering leads over the Dallas Mavericks in 2005 and the Jazz in 2007. After the 2007 elimination, Van Gundy was fired, and the Rockets hired Rick Adelman to replace him. Houston acquired Tracy McGrady in 2004. For the 2008–09 season, the Rockets signed forward Ron Artest. While McGrady wound up playing only half the games before enduring a season-ending microfracture surgery, the Rockets ended the season 53–29, enough for the Western Conference's fifth seed. During the playoffs, the Rockets beat the Portland Trail Blazers four games to two, winning their first playoff round since 1997. During the series, Dikembe Mutombo injured his knee, which forced him to retire after 18 seasons in the NBA. However, the second round against the Lakers had the Rockets losing 4-3 and Yao Ming suffering yet another season-ending injury, this time a hairline fracture in his left foot. During the 2009–10 season, the Rockets saw the departures of Artest in the off-season and McGrady, Joey Dorsey and Carl Landry during mid-season trades. Despite great play by Kevin Martin, who arrived from the Kings, and Aaron Brooks, who would eventually be chosen as the Most Improved Player of the season, the Rockets could not make it to the playoffs, finishing 42–40, 3rd in the Southwest Division. At that time, the Rockets set an NBA record for best record by a team with no All-Stars. The Rockets would also finish ninth in the Western Conference for the following two seasons, with Yao Ming getting a season-ending injury seven games into the 2010–11 season and deciding to retire during the 2011 off-season. Said off-season, which saw the NBA going through a lockout, had Adelman dismissed, and general manager Daryl Morey deciding to start a revamp of the Rockets based on advanced statistical analytics (similar to sabermetrics in baseball) in player acquisitions and style of play. Kevin McHale was named head coach, and the roster saw significant changes. After the roster moves made by Morey during the 2012 NBA off-season, only four players were left from the 2011–12 Rockets roster: Chandler Parsons, Greg Smith, Marcus Morris and Patrick Patterson, with the latter two leaving through trades during the 2012–13 season. The most important acquisition was reigning sixth man of the year James Harden, who Morey called a "foundational" player which he expected to be Houston's featured player after a supporting role in the Oklahoma City Thunder. Harden caused an immediate impact as part of the starting lineup for the Rockets, with 37 points, 12 assists, 6 rebounds, 4 steals, and a block in the season opener against the Detroit Pistons, and an average of 25.9 points a game through the season. Combining Harden's performance and McHale's up-tempo offense, the Rockets became one of the highest scoring offenses in the NBA, leading the league in scoring for the majority of the season. In the postseason, the Rockets fell to the Oklahoma City Thunder in the first round, losing the series 4–2. 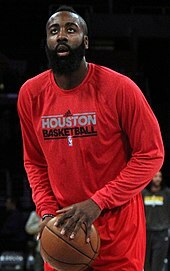 James Harden arrived in Houston in 2012, and has since become a franchise player for the Rockets. Eager to add another franchise player to their team, the Rockets heavily pursued Jeremy Lin, the first American of Taiwanese and Chinese descent to play in the National Basketball Association (NBA), led the Knicks to seven straight victories while establishing an NBA scoring record in July 2012. Also, they pursued free agent center Dwight Howard in the 2013 off-season. He officially signed with the Rockets on July 13, 2013. Led by the new inside-out combination of Howard and James Harden, and with a strong supporting cast including Chandler Parsons, Jeremy Lin, and Ömer Aşık, the Rockets were expected to jump into title contention in the upcoming season. However, that postseason, the Rockets were defeated in the first round by the Portland Trail Blazers, losing the series 4–2. Still, in the 2014–15 season, without Lin and Parsons but reinforced by Trevor Ariza, the Rockets started the season well, winning the first four games of the season for the first time since 1996–97, and winning each of their first six games by 10 points or more, the first team to accomplish this feat since the 1985–86 Denver Nuggets. While the Rockets had many key players miss time throughout the entire season, James Harden took it upon himself to keep the Rockets near the top of the conference, turning him into an MVP front-runner. He became the first Rocket to score 50 points in a game since Hakeem Olajuwon, as well as the only player in franchise history to record multiple 50 point games in a season. On April 15, 2015, the Rockets beat the Jazz to claim their first ever Southwest Division title and first Division crown since 1994, and by completing 56 wins finished with the third-best regular season record in franchise history. During the playoffs, the Rockets beat the Mavericks 4–1 in the first round, and overcame a 3–1 deficit against the Los Angeles Clippers to win the Western Semifinals and return to the Conference Finals for the first time in 18 years. In the Conference Finals, the Rockets were defeated by the Golden State Warriors 4–1. The 2015–16 season saw Kevin McHale fired after a bad start where the team only won 4 of its first 11 games, and assistant J. B. Bickerstaff took over coaching duties. Inconsistent play led to the Rockets struggling to remain in the playoff qualifying zone, and surrounded by trade rumors. Houston only clinched its 2016 playoffs spot by winning its last game, finishing the season 41–41 to earn an eight seed and a match-up against the Warriors. Like in the previous year, the Rockets were once again defeated by Golden State in 5 games. During the 2016 off-season, Mike D'Antoni was named as the Rockets' new head coach, and Dwight Howard opted out of his contract's final year, becoming a free agent. In the following free-agency period, the Rockets looked to embrace the play styles of both coach D'Antoni and Harden through the signings of Ryan Anderson and Eric Gordon, two predominately perimeter players and good fits in Houston's up-tempo offense style. When the 2016–17 season started, Harden was off to a great start and was widely considered a top MVP runner along with Kawhi Leonard, alongside former teammate Russell Westbrook. When the season ended, the Rockets were third in both the Western Conference and overall rankings, a major improvement from the season before. D'Antoni was named the NBA Coach of the Year, Eric Gordon the Sixth Man of the Year, and Harden finished second in MVP voting to Russell Westbrook. In the playoffs, the Rockets faced the sixth seeded Oklahoma City Thunder in a battle of the MVP frontrunners, as the winner was not announced until after the finals. The Rockets won the series 4–1 including Nene Hilario's perfect 12–12 in field goals in Game 4. In the following round, Houston opened with a dominating 27 points win over the San Antonio Spurs, lost the following two games and then tied the series again. Game 5 went into overtime and had both Manu Ginobili blocking James Harden's game tying three point attempt at the final second, and Nene injuring himself out of the postseason. Without Nene, the Rockets could not guard LaMarcus Aldridge, who scored 34 points and grabbed 12 rebounds in the series-closing match. During the 2017 off-season, the Rockets were purchased by Houston restaurant billionaire Tilman Fertitta for $2.2 billion, breaking the record for the price to purchase an American professional sports team. The team also acquired 8 time All-NBA player and 9 time All-Star Chris Paul in a trade from the Los Angeles Clippers, in exchange for seven players, cash considerations, and a top three protected 2018 first round draft pick. Even if Paul missed many games due to a knee injury, he was a key addition to the Rockets. The team finished the season with 65 wins, a record both league-leading and the best in franchise history. During the playoffs, Houston easily beat the Minnesota Timberwolves and Utah Jazz before another confrontation with the Golden State Warriors. In game 5 of the Conference Finals, the Rockets took a 3–2 lead in the series, but saw Paul leave with an injured hamstring. His absence was felt in the two remaining games, where Houston led by halftime only to suffer a comeback by Golden State. List of the last five seasons completed by the Rockets. For the full season-by-season history, see List of Houston Rockets seasons. The Summit (later Compaq Center) hosted the Rockets from 1975 to 2003, and was also the site where the Rockets won both of their NBA titles in 1994 and 1995. Today the site is the worship center for Lakewood Church. Toyota Center is the current home of the Houston Rockets. During the four years the Rockets were in San Diego, they played their games in the San Diego Sports Arena, which had a seating capacity of 14,400. In their first season after moving to Houston, the Rockets did not have their own arena, and they played their first two years at various venues in the city, including the Astrodome, AstroHall, Sam Houston Coliseum and Hofheinz Pavilion, the latter eventually being adopted as their home arena until 1975. They also had to play "home" games in other cities such as San Antonio, Waco, Albuquerque, and even San Diego in efforts to extend the fan-base. During their first season, the Rockets averaged less than 5,000 fans per game (roughly half full), and in one game in Waco, there were only 759 fans in attendance. Their first permanent arena in Houston was the 10,000 seat Hofheinz Pavilion on the campus of the University of Houston, which they moved into starting in their second season. They played in the arena for four years, before occupying The Summit in 1975. The arena, which could hold 16,611 spectators, was their home for the next 28 years. It was renamed the Compaq Center from 1998 to 2003. Following the 1994 title, the Rockets had a sellout streak of 176 consecutive home games, including the playoffs, which lasted until 1999. However, the struggling 2000–01 and 2001–02 seasons saw Houston having the worst attendance average in the league, with less than 12,000 spectators each season. 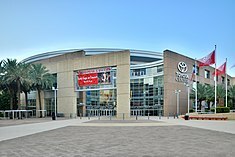 For the 2003–04 season, the Rockets moved into their new arena, the Toyota Center, with a seating capacity of 18,500. During the 2007–08 season where the team achieved a 22-game winning streak, the Rockets got their best numbers to date, averaging 17,379 spectators. These were exceeded once James Harden joined the team in 2013. The Rockets averaged 18,123 spectators during the 2013–14 season, selling out 39 out of the 41 home games. The 2014–15 season had even better numbers, with 40 sellouts and an average of 18,230 tickets sold. When the Rockets debuted in San Diego, their colors were green and gold. Road uniforms featured the city name, while the home uniforms feature the team name, both in a serifed block lettering. This was the only uniform design the Rockets would use throughout their years in San Diego. The Rockets' first logo featured a rocket streaking with a basketball surrounded by the team name. Upon moving to Houston in 1971, the Rockets replaced green with red. They kept the same design from their San Diego days, save for the change of color and city name. The logo used is of a player with a spinning basketball launching upward, with boosters on his back, leaving a trail of red and gold flames and the words "Houston Rockets" below it. For the 1972–73 season, the Rockets introduced the famous "mustard and ketchup" logo, so dubbed by fans, featuring a gold basketball surrounded by two red trails, with "Houston" atop the first red trail and "Rockets" (all capitalized save for the lowercase 'E' and 'T') in black surrounding the basketball. The initial home uniforms, used until the 1975–76 season, features the city name, numbers and serifed player name in red with gold trim, while the away uniforms feature the city name (all capitalized except for the lower case 'T' and 'N'), numbers and serifed player name in gold with white trim. In the 1976–77 season, the Rockets modified their uniforms, featuring a monotone look on the Cooper Black fonts and white lettering on the road uniforms. On the home shorts, the team logo is located on the right leg, while the away shorts feature the team name wordmark on the same location. With minor modifications in the number font, this version was used in all four of their NBA Finals appearances, including their 1994 and 1995 championships. Following the 1995 title, the Rockets opted to modernize their look. After a fan contest with over 5,000 entries, the team went with the idea of Missouri City artist Thomas Nash of a rocket orbiting a basketball, which was then reworked by Houston designer Chris Hill. Nash would later sue the Rockets for breach of contract, given they were using his idea despite not having paid the contest prizes. The NBA suggested that the identity should follow the cartoon-inspired imagery that other teams adopted during the 1990s, leading to a rocket painted with sharkmouth nose art orbiting a basketball. Red was retained, but navy blue and silver became the uniform's primary colors. Both the home white and away navy uniforms featured gradient-fading pinstripes and futuristic number fonts, with side stripes of navy fading to red. This was used until the 2002–03 season. The Rockets' current logos and uniforms were introduced in the 2003–04 season, created by New York-based agency Alfafa Studio in association with Japanese designer Eiko Ishioka. The logo is a stylized 'R' in the shape of a rocket during takeoff, surrounded by a red orbit streak that can be interpreted as the central circle of a basketball court. Said "R" inspired the team's new custom typeface, designed so that every single digit could be read well from a distance, whether in the arena or on television. Red once again became the dominant color, with silver and black as secondary. In 2009, the Rockets invoked the championship years with an alternate red uniform, featuring gold numbers and side stripes. The Rockets had two sleeved alternate jerseys for the 2015–16 season, an alternate silver-colored uniform whose design referenced the design of NASA's Gemini-Titan rocket, and a red and gold jersey featuring the nickname "Clutch City". For the 2016–17 season, the Rockets began to wear a black alternate uniform. Following the switch to Nike in 2017, the Rockets made some slight tweaks to the uniform. While the black "Statement" uniform remained mostly unchanged, the red "Icon" and white "Association" uniforms now feature truncated side striping that no longer wrap around the shoulders. The Rockets also wore a "City" uniform that was similar to their red "Icon" uniforms but with Chinese lettering in place of "Rockets" in front. Clutch the Bear is the Rockets' mascot. The mascot was introduced on March 14, 1995 formerly known as "Clutch" . From 1993 to 1995, the mascot was Turbo, a costumed man that performed acrobatic dunks and other maneuvers. In 1995, the Rockets debuted Clutch the Bear as a second mascot, a large teddy bear-like mascot that performs a variety of acts during the games. After eight years of serving as dual mascots, the performer playing Turbo retired, making Clutch the sole mascot for the team. The mascot was considered and voted fifth for the most recognizable mascot in the league, and was also inducted in the 2006 mascot Hall of Fame. The Rockets have developed many rivalries within the Western Conference ever since the team returned there in 1980. Two are intrastate rivalries, with the San Antonio Spurs, who moved along with the Rockets after four years with them in the Eastern Conference, and the Dallas Mavericks, introduced that very season. Houston has faced both Texas teams in playoffs since 1980, beating the Spurs three times and losing once. The Rockets lost twice to the Mavericks, while beating them once. Other famed rivalries were with the Los Angeles Lakers, who in the 1980s Showtime era only missed the NBA Finals when beaten by the Rockets, and the Utah Jazz, who the Rockets beat in both championship seasons but were defeated by Utah in five other occasions. Bold denotes still active with team. Italics denotes still active but not with team. For the complete list of Houston Rockets players, see Houston Rockets all-time roster. For the players drafted by Houston Rockets, see List of Houston Rockets first and second round draft picks. The Rockets hold the draft rights to the following unsigned draft picks who have been playing outside the NBA. A drafted player, either an international draftee or a college draftee who is not signed by the team that drafted him, is allowed to sign with any non-NBA teams. In this case, the team retains the player's draft rights in the NBA until one year after the player's contract with the non-NBA team ends. This list includes draft rights that were acquired from trades with other teams. 1 Also served as head coach (1991–2003). 2 As Dawson did not play for the Rockets, the team used his initials. 1 All three players were also inducted to the Hall of Fame as members of the 1992 Olympic team. ^ "Rockets All-Time Record" (PDF). Houston Rockets 2017–18 Media Guide. NBA Properties, Inc. October 13, 2017. Retrieved April 5, 2018. ^ "NBA.com/Stats–Houston Rockets seasons". National Basketball Association. Retrieved January 29, 2017. ^ "General Information" (PDF). Houston Rockets 2017-18 Media Guide. NBA Properties, Inc. October 13, 2017. Retrieved April 5, 2018. ^ "Houston Rockets Reproduction and Usage Guideline Sheet". NBA Properties, Inc. Retrieved March 8, 2018. ^ "ROKiT Phones Named Inaugural Jersey Partner". Rockets.com (Press release). NBA Media Ventures, LLC. October 16, 2018. Retrieved October 16, 2018. ^ "TILMAN J FERTITTA NEW OWNER OF THE HOUSTON ROCKETS". Rockets.com. NBA Media Ventures, LLC. October 6, 2017. Retrieved December 17, 2017. ^ a b c d e f g "Owners, fans waited years before Rockets took off". Houston Chronicle. September 20, 2001. Retrieved May 13, 2008. ^ a b c d e f g "Going Retro: Houston Rockets". NBA.com. Retrieved May 13, 2008. ^ a b c d Fulop, Dan (2012). Bob Breitbard: San Diego's Sports Keeper. Author House. pp. 68–70. ISBN 978-1-4772-4396-1. ^ "Jack McMahon". Basketball-Reference.com. Retrieved May 13, 2008. ^ "NBA Hall of Fame 2008". NBA.com. April 7, 2008. Retrieved May 13, 2008. ^ "1967–68 San Diego Rockets". Basketball-Reference.com. Retrieved May 13, 2008. ^ "A Roundup Of The Sports Information Of The Week". Sports Illustrated. March 25, 1968. Archived from the original on October 30, 2013. Retrieved May 13, 2008. ^ Kalb, Elliott (2003). Who's Better, Who's Best in Basketball?. McGraw-Hill Professional. p. 302. ISBN 978-0-07-141788-4. ^ "1968 NBA Draft". Basketball-Reference.com. Retrieved February 18, 2009. ^ a b "1968–69 San Diego Rockets". Basketball-Reference.com. Retrieved May 13, 2008. ^ "1969–70 San Diego Rockets". Basketball-Reference.com. Retrieved May 13, 2008. ^ "1970–71 San Diego Rockets". Basketball-Reference.com. Retrieved May 13, 2008. ^ "Professional Basketball in Texas" (PDF). Texas Almanac. Retrieved May 13, 2008. ^ Houston, whose nickname is "Space City" has been home to the Lyndon B. Johnson Space Center for over 45 years. "Johnson Space Center". NASA. Retrieved May 13, 2008. The Astros and Comets also gave their teams similar space-themed names. ^ "Alex Hannum Coaching Record". Basketball-Reference.com. Retrieved May 14, 2008. ^ "Tex Winter Coaching Record". Basketball-Reference.com. Retrieved May 14, 2008. ^ "Elvin Hayes Bio". NBA.com. Retrieved May 14, 2008. ^ UPI (January 22, 1973). "Tex Winter Fired". Ellensburg Daily Register. Retrieved May 15, 2008. ^ "1974–76: A Glimmer Of Progress". Houston Rockets. Archived from the original on December 20, 2001. Retrieved November 3, 2015. ^ Hershey Jr., Robert D. (November 3, 1999). "Kenneth L. Schnitzer, 70, Dies; Innovative Houston Developer". Retrieved October 25, 2015. ^ Curtis, Gregory (July 1977). "Up, Up, and Away". Texas Monthly. pp. 141–6. ^ "1974–75 Houston Rockets". Basketball-Reference.com. Retrieved May 15, 2008. ^ Kirkpatrick, Curry (January 2, 1978). "Shattered And Shaken". Sports Illustrated. Archived from the original on November 12, 2009. Retrieved May 29, 2008. ^ Moore, David Leon (November 26, 2002). "New start from old wounds". USA Today. Retrieved May 29, 2008. ^ "1977–78 Houston Rockets". Basketball-Reference.com. Retrieved May 29, 2008. ^ "Rick Barry Bio". NBA.com. Retrieved May 29, 2008. ^ a b "Moses Malone Bio". NBA.com. Retrieved May 15, 2008. ^ "1978–79 Houston Rockets". Basketball-Reference.com. Retrieved May 29, 2008. ^ "History: 1978–80: Malone Shines, But Houston Stumbles In Playoffs". Houston Rockets. Archived from the original on December 20, 2001. Retrieved November 3, 2015. ^ Lindgren, Hugo (February 15, 2004). "The Flying Maloof Brothers". The New York Times. Retrieved June 2, 2015. ^ a b "Nuggets, Rockets Are Sold". New York Times. June 16, 1982. Retrieved June 2, 2015. ^ DuPree, David (September 26, 1980). "NBA Realignment Hurts Bullets". Washington Post. Retrieved May 30, 2008. ^ "1980–81 NBA Season Summary". Basketball-Reference.com. Retrieved February 18, 2009. ^ "Is Warriors over Mavs greatest upset ever?". ESPN. May 4, 2007. Retrieved May 30, 2008. ^ "Celtics Return to Glory". NBA.com. Retrieved May 30, 2008. ^ a b c Cotton, Anthony (October 31, 1983). "It's Just A Matter Of Time". Sports Illustrated. ^ "1982–83 NBA Season Summary". Basketball-Reference.com. Retrieved February 18, 2009. ^ "1983 NBA Draft". Basketball-Reference.com. Retrieved February 18, 2009. ^ a b "Ralph Sampson Statistics". Basketball-Reference.com. Retrieved February 18, 2009. ^ "1984 NBA Draft". Basketball-Reference.com. Retrieved February 18, 2009. ^ "NBA.com: Hakeem Olajuwon Player Info". NBA.com. Retrieved February 18, 2009. ^ "1984–85 Houston Rockets Roster and Statistics". Basketball-Reference.com. Retrieved February 18, 2009. ^ "Rockets History – 1983–85: How Do You Stop Two 7-Footers?". NBA.com. Archived from the original on December 29, 2007. Retrieved February 18, 2009. ^ a b Winder, Dave. "1986: Tough to the Finish". Houston Rockets official website. Retrieved June 3, 2015. ^ "1986 NBA Finals: Boston 4, Houston 2". NBA.com. Retrieved June 3, 2015. ^ Abrams, Jonathan (November 8, 2012). "The Greatest Team That Never Was". Grantland. Retrieved June 30, 2015. ^ Howerton, Darryl. "Budding Dynasty", NBA.com, June 14, 2012. ^ "1988 NBA Playoff Summary". Basketball-Reference.com. Retrieved February 19, 2009. ^ "1989 NBA Playoff Summary". Basketball-Reference.com. Retrieved February 19, 2009. ^ "1990 NBA Playoff Summary". Basketball-Reference.com. Retrieved February 19, 2009. ^ a b "Don Chaney Coach Info". NBA.com. Retrieved February 19, 2009. ^ "Houston's Don Chaney NBA Coach of the Year". Jet. June 17, 1991. Retrieved June 30, 2015. ^ "Rockets History – 1990–92: Houston Struggles Without Hakeem". NBA.com. Archived from the original on December 29, 2007. Retrieved February 21, 2009. ^ "Sports People: Basketball – Chaney Out in Houston; Rudy T. Takes Over". The New York Times. February 19, 1992. Retrieved February 19, 2009. ^ "1991–92 Houston Rockets Roster and Statistics". Basketball-Reference.com. Retrieved February 19, 2009. ^ "Rockets History – 1992-93: "Rudy T" Sees Season End In OT". NBA.com. Archived from the original on December 29, 2007. Retrieved February 21, 2009. ^ a b Blount, Terry (June 24, 1994). "Olajuwon caps year of honors". Houston Chronicle. Archived from the original on October 12, 2012. Retrieved February 21, 2009. ^ a b c d "Houston Rockets". Basketball-Reference.com. Retrieved May 14, 2008. ^ "1993–94 Houston Rockets Roster and Statistics". Basketball-Reference.com. Retrieved February 21, 2009. ^ "Rockets History – 1993–94: Rockets Shoot To NBA Title". NBA.com. Archived from the original on December 29, 2007. Retrieved February 21, 2009. ^ "Rockets History – 1994–95: "Clutch City" – Rockets Repeat". NBA.com. Archived from the original on December 29, 2007. Retrieved February 21, 2009. ^ Sefko, Eddie (February 15, 1995). "Reunion with fraternity mate a thrill for Olajuwon". Houston Chronicle. Archived from the original on October 12, 2012. Retrieved February 21, 2009. ^ Pendergast, Sean (April 21, 2015). "Clutch City: An Oral History of the Houston Rockets Miracle Playoff Run". Houston Press. Retrieved February 21, 2016. ^ Stickney, Jr., W.H. (June 18, 1995). "Rockets overcome countless obstacles en route to repeat". Houston Chronicle. Archived from the original on October 12, 2012. Retrieved February 21, 2009. ^ Sefko, Eddie (June 18, 1995). "Rockets' remarkable run is a story worth repeating". Houston Chronicle. Archived from the original on June 29, 2011. Retrieved February 21, 2009. ^ a b Barron, David (June 29, 1995). "Out with the old, In with the new". Houston Chronicle. ^ a b "1995–96 Houston Rockets Roster and Statistics". Basketball-Reference.com. Retrieved February 22, 2009. ^ "Rockets History – 1995–96: Bid For Three Swept Away". NBA.com. Archived from the original on December 29, 2007. Retrieved February 22, 2009. ^ Sefko, Eddie (August 19, 1996). "Rockets finally get Barkley". Houston Chronicle. Archived from the original on October 12, 2012. Retrieved February 22, 2009. ^ "1996–97 Houston Rockets Roster and Statistics". Basketball-Reference.com. Retrieved February 22, 2009. ^ "Rockets History – 1996–97: Barkley Rockets Fly High". NBA.com. Archived from the original on December 29, 2007. Retrieved February 22, 2009. ^ "Rockets History – 1997–98: High on Heart". NBA.com. Archived from the original on December 29, 2007. Retrieved February 22, 2009. ^ "1998–99 Houston Rockets Roster and Statistics". Basketball-Reference.com. Retrieved February 22, 2009. ^ Feigen, Jonathan; Murphy, Michael (October 2, 1999). "Rockets unload Pippen to Blazers". Houston Chronicle. Archived from the original on October 12, 2012. Retrieved February 22, 2009. ^ Feigen, Jonathan (December 9, 1999). "Torn tendon ends Sir Charles' career". Houston Chronicle. Archived from the original on June 29, 2011. Retrieved February 22, 2009. ^ "1999–00 Houston Rockets Roster and Statistics". Basketball-Reference.com. Retrieved February 22, 2009. ^ "2000–01 Houston Rockets Roster and Statistics". Basketball-Reference.com. Retrieved February 23, 2009. ^ "2001–02 Houston Rockets Roster and Statistics". Basketball-Reference.com. Retrieved February 23, 2009. ^ "2002–03 Houston Rockets Roster and Statistics". Basketball-Reference.com. Retrieved February 23, 2009. ^ "2002–03 NBA Season Summary". Basketball-Reference.com. Retrieved February 23, 2009. ^ a b Feigen, Jonathan (October 10, 2003). "New arena buoys spirits". Houston Chronicle. Archived from the original on October 12, 2012. Retrieved February 23, 2009. ^ a b Feigen, Jonathan (September 21, 2003). "Red's in fashion again". Houston Chronicle. Archived from the original on June 29, 2011. Retrieved July 28, 2015. ^ Broussard, Chris (June 10, 2003). "Pro Basketball – Van Gundy Accepts Job As Coach of the Rockets". New York Times. Retrieved February 23, 2009. ^ a b "2003–04 Houston Rockets Roster and Statistics". Basketball-Reference.com. Retrieved February 23, 2009. ^ Blinebury, Fran (December 8, 2010). "Failures, injuries mark T-Mac's memories of paring with Yao". NBA.com. Retrieved February 23, 2016. ^ Feigen, Jonathan (May 18, 2007). "Van Gundy dismissed as Rockets coach". Houston Chronicle. Retrieved February 23, 2009. ^ Feigen, Jonathan (May 21, 2008). "Adelman reaches deal to coach Rockets". Houston Chronicle. Retrieved February 23, 2009. ^ "McGrady says he will have surgery". ESPN. February 2, 2008. Retrieved June 30, 2015. ^ "2009 NBA Playoffs - First Round - Rockets vs. Trailblazers". ESPN.com. Retrieved February 23, 2009. ^ "NBA Playoffs 2009- Western Conference - Los Angeles vs Houston". NBA.com. Retrieved February 23, 2015. ^ "Houston Rockets make history while missing the playoffs". ESPN. Retrieved June 30, 2015. ^ "That's a wrap. But what's next? What should be?". Ultimate Rockets. Retrieved June 30, 2015. ^ Dwyer, Kelly (December 19, 2011). "Ball Don't Lie's 2011-12 Season Previews: Houston Rockets". Yahoo! Sports. Retrieved June 30, 2015. ^ "Rockets fall to Heat, eliminated from playoff contention". KHOU. April 23, 2012. Retrieved June 30, 2015. ^ "Chinese great Yao Ming retires from NBA". CBC. Associated Press. July 20, 2011. Retrieved July 20, 2011. ^ "Rick Adelman won't return as Houston Rockets' head coach". ESPN. Retrieved June 30, 2015. ^ a b c d Mason, Beckley (April 5, 2013). "The Rockets are ready for liftoff". ESPN. Retrieved June 30, 2015. ^ Winderman, Ira. "Miami Heat, LeBron James, Dwyane Wade, Chris Bosh commentary from Ira Winderman". South Florida Sun-Sentinel. Retrieved June 30, 2015. ^ "GM: James Harden is 'foundational'". ESPN. October 29, 2012. ^ "Houston Rockets vs. Detroit Pistons - Box Score - October 31, 2012 - ESPN". ESPN. Retrieved June 30, 2015. ^ Mark Travis (April 12, 2013). "2012–13 Houston Rockets season review: One giant step". CCCT. Retrieved June 30, 2015. ^ "Thunder vs. Rockets - Western Conference First Round - 2013 NBA Playoffs". NBA.com. Retrieved June 30, 2015. ^ Park, Michael (December 2015). "Race, Hegemonic Masculinity, and the "Linpossible!" An Analysis of Media Representations of Jeremy Lin". Communication and Sport. 3 (4): 367–389. doi:10.1177/2167479513516854. ^ "Howard Selects Houston in Free Agency". Houston Rockets. Retrieved June 30, 2015. ^ "2013–14 outlook - Houston Rockets". ESPN. October 25, 2014. Retrieved June 30, 2015. ^ "Rockets vs. Trail Blazers - Western Conference First Round - 2014 NBA Playoffs". NBA.com. Retrieved June 30, 2015. ^ "Rockets at 76ers". NBA.com. Retrieved June 30, 2015. ^ "Spurs at Rockets". NBA.com. Retrieved June 30, 2015. ^ "Nuggets at Rockets". NBA.com. Retrieved June 30, 2015. ^ "Kings at Rockets". NBA.com. Retrieved June 30, 2015. ^ "Rockets clinch Southwest Division with win over Jazz". Reuters. Retrieved June 30, 2015. ^ AP (May 17, 2015). "Rockets back in conference finals first 1st time since '97". USA TODAY. Retrieved June 30, 2015. ^ Taylor, Phil. "Warriors return to NBA Finals with win over Rockets in Game 5". Sports Illustrated. Retrieved June 30, 2015. ^ "Rockets fire coach Kevin McHale". ESPN. November 18, 2015. Retrieved November 20, 2015. ^ Boylan-Pett, Liam (March 28, 2016). "NBA scores 2016: The erratic Rockets are playing their way out of the playoffs". SB Nation. Retrieved March 30, 2016. ^ Herbert, James (February 15, 2016). "Report: Rockets, Heat talk Dwight Howard-Hassan Whiteside swap". CBS Sports. Retrieved March 30, 2016. ^ Rieken, Kristie (April 13, 2016). "Rockets clinch playoff berth with 116-81 win over Kings". Associated Press. Retrieved April 13, 2016. ^ NBA.com. "Warriors oust Rockets, storm into West semis". NBA.com. Retrieved April 28, 2016. ^ "Rockets Name Mike D'Antoni Head Coach". NBA. June 1, 2016. Retrieved June 1, 2016. ^ Watkins, Calvin (June 22, 2016). "Source: Dwight Howard opts out despite Rockets' efforts to keep him". ESPN. Retrieved June 22, 2016. ^ "Rockets Sign Free Agents Ryan Anderson and Eric Gordon". NBA.com. July 8, 2016. Retrieved July 12, 2016. ^ Smith, Sekou (November 11, 2016). "Russell Westbrook stands out most as new MVP chase begins". NBA.com. Retrieved June 1, 2017. ^ "2017 NBA Awards Complete List Of Winners". NBA.com. June 26, 2017. Retrieved June 28, 2017. ^ Blinebury, Fran (April 13, 2017). "Series preview: Houston Rockets-Oklahoma City Thunder series could entertain mightily". NBA.com. Retrieved June 28, 2017. ^ "Nene's 28 lead Rockets past Thunder for 3-1 series lead". ESPN.com. April 23, 2017. Retrieved April 24, 2017. ^ Habel, Steve (May 8, 2017). "2017 NBA Playoffs: Houston Rockets-San Antonio Spurs Game 5 preview, update". The Sports Xchange. Retrieved April 24, 2018. ^ Habel, Steve (May 10, 2017). "Manu Ginobili blocks James Harden at buzzer, San Antonio Spurs win over Houston Rockets". The Sports Xchange. Retrieved April 24, 2018. ^ MacMahon, Tim (May 8, 2017). "Rockets center Nene out for rest of playoffs with groin injury". ESPN.com. Retrieved May 9, 2017. ^ "Spurs rout James Harden, Rockets 114-75 to win series". ESPN.com. May 11, 2017. Retrieved May 11, 2017. ^ Rieken, Kristie (October 10, 2017). "Tilman Fertitta introduced as the new owner of the Houston Rockets". The Associated Press. Retrieved May 29, 2018. ^ "Teams like the Rockets rarely come available. That's why they're being sold for $2.2 billion". September 5, 2017. ^ "'Weapons race': Rockets tout CP3-Harden pair". ESPN.com. June 28, 2017. Retrieved June 28, 2017. ^ Rieken, Kristie (June 28, 2017). "LA Clippers trade Chris Paul to Houston Rockets". NBA.com. Retrieved June 28, 2017. ^ Bontemps, Tim (December 21, 2017). "Chris Paul's injury against the Lakers underscores the fragile nature of the magnificent Rockets". The Washington Post. Retrieved May 28, 2018. ^ "NBA season of milestones: Notable moments mark 2017-18 campaign". NBA.com. April 12, 2018. Retrieved May 28, 2018. ^ Deveney, Sean (May 14, 2018). "Rockets vs. Warriors: Preview, predictions as Western Conference powerhouses collide". Sporting News. Retrieved May 28, 2018. ^ Varga, George (September 9, 2008). "Arm of entertainment giant taking over at Sports Arena". San Diego Union-Tribune. Retrieved February 27, 2009. ^ Horton, Marianne (July 2005). "Lakewood Church Set to Open Doors". H Texas Magazine. Archived from the original on October 9, 2007. Retrieved February 27, 2009. ^ Feigen, Jonathan (June 30, 2002). "Drafting Yao Ming means big business for Rockets". Houston Chronicle. Retrieved October 25, 2015. ^ "NBA Attendance Report – 2008". ESPN. Retrieved March 1, 2009. ^ Creech, Jenny Dial (October 1, 2014). "Rockets to unveil new luxury suites at Toyota Center for Rockets' season". Houston Chronicle. Retrieved October 25, 2015. ^ "NBA Attendance Report – 2014". ESPN. Retrieved March 1, 2009. ^ "Rockets Win Logo Suit But Still May Have to Pay Artist". Houston Chronicle. June 27, 1997. Retrieved June 2, 2015. ^ "Nash v. Houston Rockets, et al". LegalMetric. Archived from the original on November 20, 2015. Retrieved June 2, 2015. ^ Devadanam, Steven (August 2003). "Rocket Science". In Town Magazine. Houston Chamber of Commerce. Archived from the original on November 21, 2004. ^ "Houston Rockets". Alfafa Studio. Retrieved May 25, 2015. ^ Barron, David (July 8, 2003). "Rockets settle on new logo". Houston Chronicle. Retrieved May 25, 2015. ^ Friedman, Jason (September 24, 2009). "Rockets Unveil Alternate Jersey". Houston Rockets. Retrieved July 28, 2015. ^ Godwin, Jordan (November 6, 2009). "Rockets' new alternate jerseys have look of a champion". Houston Chronicle. Retrieved May 25, 2015. ^ Lukas, Paul (September 16, 2015). "Rockets display trio of new alternates, including 'Clutch City' design". ESPN. Retrieved May 25, 2015. ^ "Rockets: Turbo". Retrieved June 30, 2015. ^ Hlavaty, Craig (August 16, 2010). "Mascot School: How To Entertain, And What About Having To Pee?". Houston Press. Retrieved July 1, 2013. ^ "Rockets-Spurs rivalry's top moments". Beaumont Enterprise. April 11, 2015. Retrieved June 30, 2015. ^ "Series sets up Dallas Mavericks-Houston Rockets to be a real rivalry – Dallas Mavericks Blog – ESPN". ESPN. Retrieved June 30, 2015. ^ "Houston Rockets Playoff History". RealGM. Retrieved June 30, 2015. ^ "Photos: Key moments from Rockets-Lakers rivalry". Ultimate Rockets. Retrieved June 30, 2015. ^ Diana Allen. "Rockets-Jazz: The Best Rivalry You Haven't Heard Of". Bleacher Report. Retrieved June 30, 2015. ^ "Moses Malone Statistics". Basketball-Reference.com. Retrieved March 3, 2009. ^ a b "Hakeem Olajuwon Statistics". Basketball-Reference.com. Retrieved March 3, 2009. ^ "James Harden Statistics". Basketball-Reference.com. Retrieved June 25, 2018. ^ "Elvin Hayes Statistics". Basketball-Reference.com. Retrieved March 3, 2009. ^ "James Harden Statistics". Basketball-Reference.com. Retrieved April 12, 2018. ^ "NBA Awards – Executive of the Year". Sports Illustrated. Archived from the original on June 29, 2011. Retrieved March 3, 2009. ^ "Rockets' Daryl Morey named NBA Executive of the Year". Houston Chronicle. June 25, 2018. Retrieved June 25, 2018. ^ "J. Walter Kennedy Citizenship Award". NBA.com. Turner Sports Interactive, Inc. Retrieved July 24, 2008. ^ "Mutombo wins J. Walter Kennedy Citizenship Award". NBA.com. April 23, 2009. Archived from the original on April 26, 2009. Retrieved April 23, 2009. ^ "Pat Beverley makes NBA All-Defensive Team on second unit". Houston Chronicle. Retrieved July 7, 2014. ^ "Durant, LeBron headline 2013–14 All-NBA First Team". NBA.com. June 4, 2014. Retrieved May 21, 2015. ^ a b "Rockets Career Leaders : Statistics". Basketball-Reference.com. Retrieved April 14, 2016. ^ "Rockets Acquire Papanikolaou, Todorovic and Two Future 2nd Round Picks". NBA.com. July 10, 2013. Retrieved April 15, 2014. ^ "Houston purchases trio of second-round picks". NBA.com. June 26, 2009. Retrieved April 15, 2014. ^ "Mavericks Get Center Chinanu Onuaku in Trade With Rockets". www.nbcdfw.com. August 1, 2018. Retrieved August 1, 2018. ^ @ShamsCharania (January 22, 2019). "Sources: Rockets and Bulls have completed trade: Carmelo Anthony, draft rights to Jon Diebler and $1.56 million to Chicago for draft rights to Tadija Dragicevoc" (Tweet) – via Twitter. ^ "Nuggets acquire swingman White from Rockets". NBA.com. September 22, 2009. Archived from the original on April 16, 2014. Retrieved April 15, 2014. ^ a b c "Houston Rockets". CBS Sports. CBS Interactive. May 15, 2010. Retrieved May 15, 2010. ^ Pierce, Damien (April 4, 2007). "Tribute to Dawson". NBA.com. Retrieved February 24, 2009. ^ "Hall of Famers". Naismith Memorial Basketball Hall of Fame. CBS Interactive. Retrieved February 14, 2015. ^ a b "Houston Rockets Media Guide 2008–09" (PDF). NBA.com. p. 154. Retrieved March 5, 2009. ^ a b c d e "Patterson's reign". Houston Chronicle. August 30, 1990. Archived from the original on May 12, 2012. Retrieved March 5, 2009. ^ Sefko, Eddie (August 31, 1993). "Rockets' Patterson era ends". Houston Chronicle. Archived from the original on May 12, 2012. Retrieved March 5, 2009. ^ Sefko, Eddie. "Rockets shaken at foundation". Houston Chronicle. Archived from the original on October 16, 2012. Retrieved March 5, 2009. ^ Sefko, Eddie (August 30, 1996). "Rockets' VP Weinhauer resigns post". Houston Chronicle. Archived from the original on May 12, 2012. Retrieved March 5, 2009. ^ Sefko, Eddie (May 24, 1996). "Dawson set for promotion". Houston Chronicle. Archived from the original on May 12, 2012. Retrieved March 5, 2009. ^ Feigen, Jonathan (May 11, 2007). "Morey officially takes charge". Houston Chronicle. Retrieved March 5, 2009. ^ a b c "Houston Rockets Media Guide 2008–09" (PDF). NBA.com. p. 137. Retrieved March 5, 2009. ^ "It's official: Tilman Fertitta owns the Rockets". chron.com. October 6, 2017. Retrieved October 6, 2017. Wikimedia Commons has media related to Houston Rockets.